It wasn't a suped up DeLorean but my Toyota Tacoma that transported me for a week this month back in time. 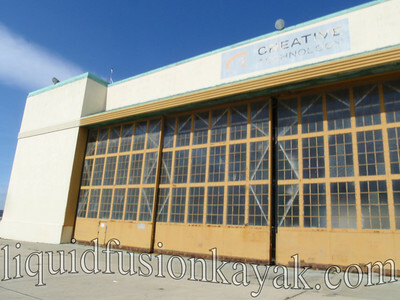 My destination wasn't small town America but the old Naval Air Station in Alameda, California. For seven days (eight due to a material issue), I felt like I was immersed in a high school woodshop class. 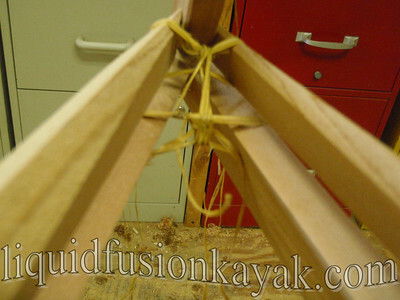 We were mostly using hand tools and techniques that the Inuits used to construct a skin on frame kayak. Many of our materials and tools were modern due to the fact that our goal was to finish these boats within a week. Our instructor's philosophy is that one could spend all day completing a task with simple tools but that doesn't leave much time for surfing. Brian Schulz of Cape Falcon Kayak was our instructor. 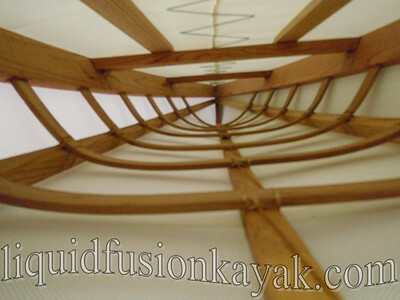 He is world renowned in the skin on frame boat design and construction. He usually teaches classes in his workshop in Manzanita, Oregon; however, he will take his tools and materials on the road to teach in other locations throughout the world. Recently Brian completed a class in Tasmania. 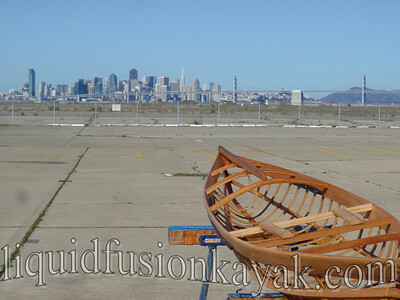 Brian was recruited to teach a class in the San Francisco Bay area by several Bay Area Sea Kayakers (BASK) because of their interest in a specific design that he builds. 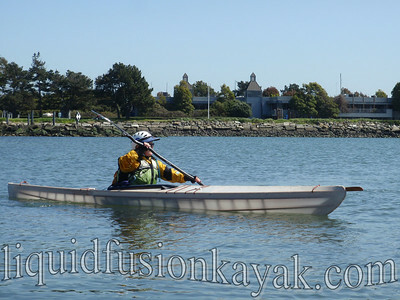 The Mariner Coaster is a popular sea kayak in the Bay Area; and Brian has designed a skin on frame version called the F-1. 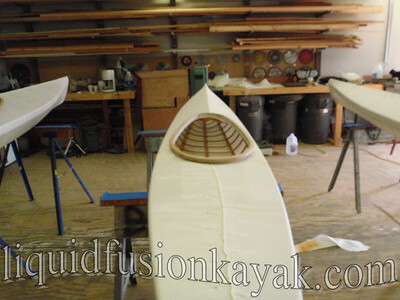 Why build a skin on frame kayak? Everyone has their own reasons. In our class, the main reasons were to have a lightweight kayak that handled rough waters well and could be built to fit a specific individual - sounds like I'm not the only Goldilocks kayaker. 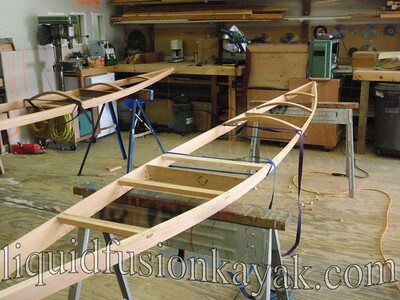 It was the Goldilocks in me that drew me to interest in Skin on Frame kayak construction. If the manufacturers didn't build a boat that fit me and my paddling needs, then maybe I could. 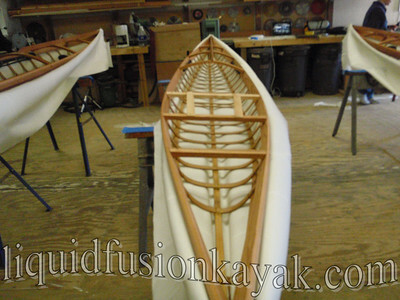 I had been researching skin on frame construction and was contemplating taking a stab at building one with a little help from my friend John who has built one with Wolfgang Brinck - Bay Area small boat builder and author of the Aleutian Kayak. Typical of one of my research projects, the kitchen table stacked up with books on skin on frame construction and the internet was scoured for information. It was awesome!!! Under Brian's guidance and assistance, Gordon, LaRhee, and I shaped wood into a frame. 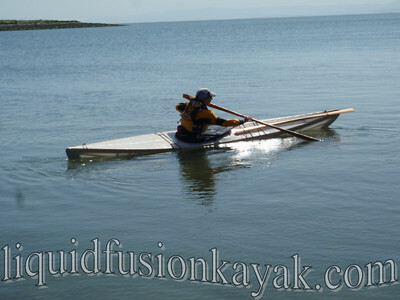 Each of our kayaks were of the same design but being customized for the size of the paddler who would be paddling them. For 3 days, we drilled holes, carved out mortices and tenons, steamed and bent wooden ribs, planed surfaces, and joined the pieces with wooden pegs and artificial sinew lashings. Many discussions ensued during the process including comparisons of the techniques and materials that we were using compared to the Inuits as well as discussions on paddling skills and techniques, philosophies of kayak instruction, sustainable organic farming, and whitewater kayaking. At the end of day 4, our frames were completed and we had carved paddles. We put our woodworking tools away and got out needles and thread. Day 5 was a fabric and sewing party. 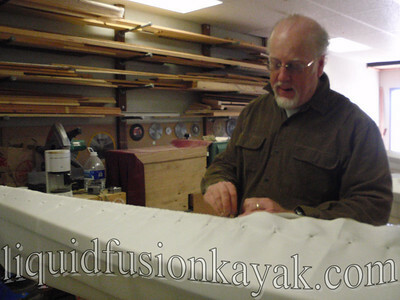 At the end of day 5, we had skinned our boats (balistic nylon not seal skins) and were wetting them to get the fabric to shrink into the shape of the frame. We wet the boats. Instead of water soaking into the fabric, it beaded up. ! @#$% - the manufacturer sent us the wrong material. The need to reorder the fabric and reskin the boats became apparent so class was dismissed until the following weekend. A little side trip 2 hangars down was in store - we ventured down to Hangar 1 for some vodka tasting to celebrate the early beginning of the weekend for us. 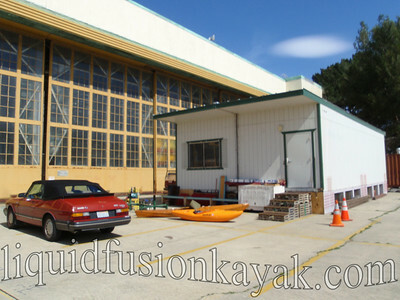 A week later, we returned to our little workshop among the hangars of the Alameda Naval Air Station. Reskinning the boats went quickly as we were now experienced boat skinners and this time the skins shrunk to fit the frame. The next morning, we treated the skins with "goop" a polyurethane mixture to seal them. 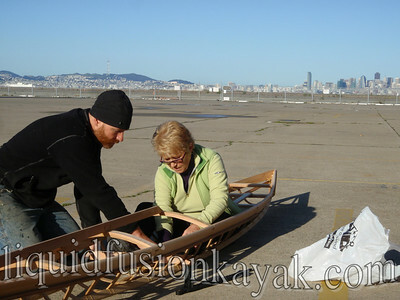 On the 7th (actually 8th day), we outfitted the boats and paddled them. And they paddled beautifully. Brian demonstrated some techniques with the Greenland Paddle and off we went. The kayak that I had built paddled smoothly in the water. The secondary stability was excellent. I practiced some edged turns with sweeps strokes and found the boat to be very responsive. The warm and sunny day inspired notions of getting my hair wet so I did some sculling and rolling and found the boat did exactly what I wanted it to do. 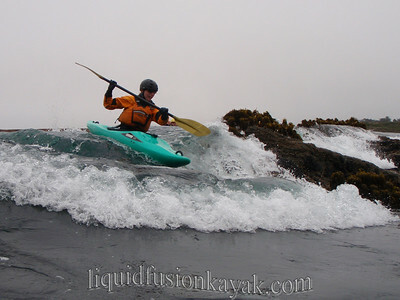 I look forward to building my own and putting it through the measures of kayaking in the surf and rock gardens of the Mendocino Coast. Maryly smiled from ear to ear as she paddled her new handmade kayak. 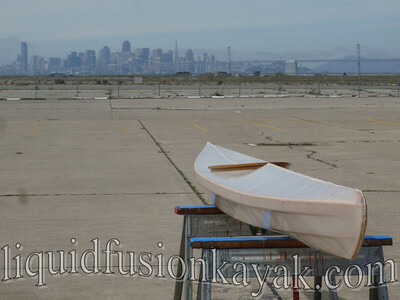 When we were finished with our test paddle, it was really cool to see her effortlessly carry it from the water to her car Mission accomplished - a lightweight, custom fit kayak!!! I can't wait to build mine!!! This boat is too wide, this boat is too deep, this boat is sooo uncomfortable . . .
Last spring I fessed up to my Goldilocks ways in my blog and online. I stuck my neck out with some posts on forums in discussions of boats for small adults. Of course I was lambasted several times on paddling.net for voicing my opinion (by men of course) but also found many other women in the same too big boat as myself. 1. Don't expect others to understand my issues with boat design and fit. Everyone is in their own boat when it comes to this subject. I do feel for those with big feet as they seem to have as many if not more fit issues than us petite paddlers do. 2. YEAH DAGGER and WAVESPORT!!!! You guys got it!!! I was stoked last year to see that Confluence Watersports' new whitewater kayaks - the Dagger Axiom and Wavesport Diesel had sizes for all sizes of adults. I reserved judgement though until I had a chance to paddle both. 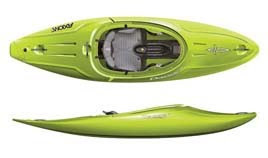 Last week, I had the chance to paddle the Dagger Axiom 8.0 and the Wavesport Diesel 60 and was stoked that both fit and performed wonderfully. Now, I have the tough decision of which boat to choose and even tougher choice of what color. 3. Kudos to The River Store in Lotus, CA on the American River. They have an excellent selection of sizes and boats in their demo fleet and very helpful employees. 4. I still love my Eskimo Kendo Starlight. Solid German plastic and a petite 29 pounds. Not my choice for creeking but definitely a fun river runner and ocean rock gardening boat. 5. If the boats don't fit, build your own. Skin on frame sea kayaks have captured my interest. 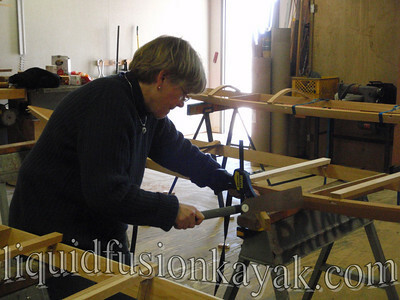 I am in the finishing stages of building one for another petite paddler and am looking forward to starting on one for myself in the near future. 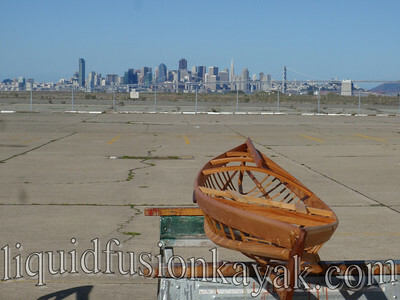 Check out Brian Schulz of Cape Falcon Kayak boats and ideas on boat design. Stay tuned to see if Goldilocks ends up with a new river runner and what color she chooses and for trials and tribulations of skin boat construction.